Sausage is the new weapon of choice in a simmering culture war in Georgia. 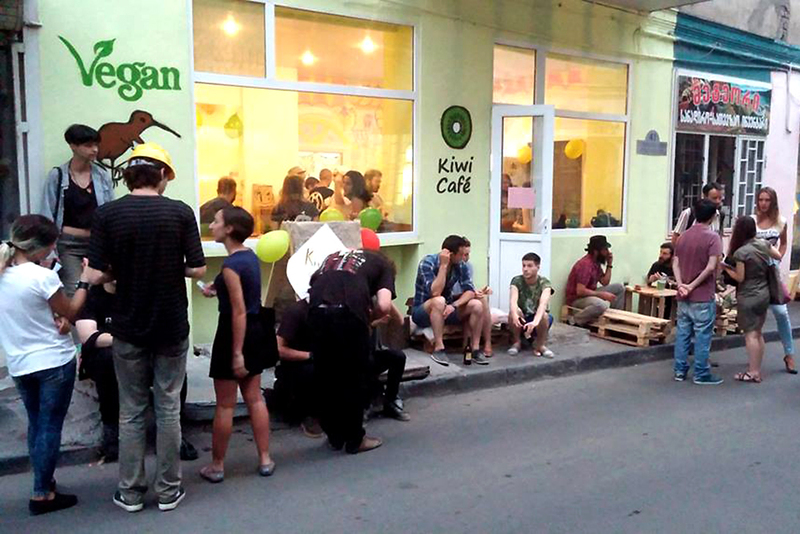 On May 29, assailants brandishing sausage burst into the tiny vegan Kiwi Café, a countercultural outpost in Tbilisi’s Old Town, spraying diners and their dishes with chunks of meat and fish, and assaulting café staffers. The clash reportedly spilled out onto the street; the assailants fled before police could arrive. Employees identified the attackers as members of Georgian Power, a nationalist group with perceived skinhead leanings. Giorgi Gegelashvili, a café employee, told Georgian Public Broadcasting that members of the radical group had a history of antagonizing staff and patrons, apparently due to strong opposition to the values that the café supports, which he identified as nihilism and pacifism. “Several days earlier, they attacked one of our friends and customers, cursed at him and spit into his face, and threatened to stage a pogrom at the café,” Gegelashvili said. Georgian Power denied involvement in the fray, maintaining that it does not harbor an anti-herbivore agenda. “Forcing meat upon vegetarians is not our priority,” the group said in a statement posted on their Facebook page on May 31. The Kiwi Café incident underscores Georgia’s emergence as a frontline state in a broad, regional culture clash that pits Russia, which casts itself as the defender “traditional” values, against the European Union and United States as the proponents of Western values. The Georgian government signed an EU association agreement in 2014, and has long sought NATO membership. But a sizable segment of society in Georgia, a strongly Orthodox Christian nation, has misgivings about Western integration – worrying specifically that the influx of Western values undermines local cultural traditions. Advocates of “traditional” values in Georgia – including nationalists and social conservatives – have become more vocal of late. Tbilisi, for example, in mid-May hosted a conclave of traditional values proponents – a gathering officially titled as the World Congress of Families – during which speaker after speaker railed against the spread of pernicious ideas advanced by the EU and US governments. “Liberalism is the enemy,” stated Levan Vasadze, a congress organizer. The values debate to date has centered on traditionally hot-button issues, including LGBT rights and abortion. But now it seems a new fault line is opening up concerning the matter of dietary choices. Ultranationalists appear to view non-meat eaters as un-Georgian and, therefore, a threat to the country’s well-being. The Kiwi Café incident produced a cornucopia of social media comment – ranging from outrage to amusement. Since force-feeding everyone is the preserve of Georgian grandmothers, some joked online that it must have been an attack of the “bebiebi,” Georgian for “grandmothers,” who were fed up with their grandchildren not eating properly. Others said, tongue-firmly-in-cheek, it was an ambush organized by the meat-packing industry. But for many, the battle at Kiwi Café was not just a random occurrence, but a disconcerting symptom of a revival of radical nationalism that had devastating effects on the country two decades ago. Georgian Power’s Facebook page is ablaze with supremacist rhetoric and photos of men in masks with raised clenched fists. The group asserts that “Georgia is for Georgians,” a slogan that was popular under the country’s first, nationalist president, Zviad Gamsakhurdia (1991-1992), who presided over a period of prolonged instability, featuring civil warfare and ethnic conflict. The group also has vented hate toward foreigners, liberals and LGBT people. Its activities are not limited to online agitation. Last year, an individual reputed to be a prominent figure in the group shared videos of Africans and Arabs harassed and punched in downtown Tbilisi. Police launched an investigation then, but nothing came of it. Civil society activists complain that the Georgian police have been generally lackluster in investigating violence directed recently at members of the political opposition, LGBT groups and foreigners. Kiwi Café staffers said that police officers accused them of provoking the May 29 incident and failing to restrain several neighbors who sided with the attackers. Authorities opened an investigation into the Kiwi Café incident the day after the attack. Critics of police conduct believe that public expressions of outrage over the incident helped prompt the police to act.